Making and design environments, often referred to as makerspaces, have aroused recent educational interest. These environments typically consist of spaces that support interest-driven engagement in hands-on creative activities with a range of digital artefacts. Although a variety of benefits from participating in making and design activities have been proposed, we currently have limited understanding of students’ learning experiences in makerspaces situated in schools. Following Hedegaards’ conceptualisations, we investigate motive-demand dynamics in students’ social activity in a school-based digital making and design environment, ‘The FUSE Studio’. We highlight our findings via vignettes selected from 65 h of video recordings of 94 students (aged between 9 and 12 years old) carrying out activities; the recordings were collected intermittently from an elective course over one semester. Our study illustrates how the students’ learning experiences were shaped through tension-laden interplay between the motives and demands of their activity situated across personal, relational and institutional contexts. 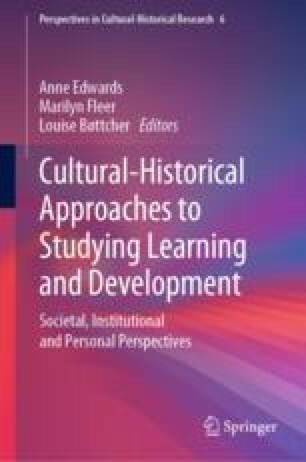 The findings make visible how established ways of working and being at school interacted and came into tension with the students’ motive orientations, thereby limiting and at times transforming the social context of their learning. Our work also demonstrates how the analysis of motive-demand dynamics offers one useful conceptual tool to unpack students’ learning experiences in novel learning environments. Benton, C., Mullins, L., Shelley, K., & Dempsey, T. (2013). Makerspaces: Supporting an entrepreneurial system. Michigan State University EDA Center for Regional Economic Innovation. http://reicenter.org/upload/documents/colearning/benton2013_report.pdf. Johnson, L., Adams Becker, S., Estrada, V., & Freeman, A. (2015). NMC horizon report: 2015 K-12 edition. Austin, Texas: The New Media Consortium. http://cdn.nmc.org/media/2015-nmc-horizon-report-k12-EN.pdf. Kumpulainen, K. (2017). Makerspaces: Why they are important for digital literacy education. In J. Marsh, et al., (Eds. ), Makerspaces in the early years: A literature review (pp. 12–16). University of Sheffield: Makey Project. http://makeyproject.eu/wp-content/uploads/2017/02/Makey_Literature_Review.pdf. Salmi, S. & Kumpulainen, K. (2017). Children’s experiencing of their transition from pre-school to first grade: A visual narrative study. Learning, Culture and Social Interaction. https://doi.org/10.1016/j.lcsi.2017.10.007. Schrock, A. R. (2014). ‘Education in disguise’: Culture of a hacker and maker space. InterActions: UCLA Journal of Education and Information Studies, 10(1). https://escholarship.org/uc/item/0js1n1qg. Stevens, R. & Jona, K. (2017). Program design. FUSE studio website. Retrieved from May 20, 2017. https://www.fusestudio.net/program-design. Stevens, R., Jona, K., Penney, L., Champion, D., Ramey, K., Hilppö, J., … Penuel, W. (2016). FUSE: An alternative infrastructure for empowering learners in schools. In C. -K. Looi, J. Polman, U. Cress, & P. Reimann (Eds.) Transforming learning, empowering learners: 12th international conference of the learning sciences (pp. 1025–1032). https://www.isls.org/icls/2016/docs/ICLS2016_Volume_2.pdf.